If you love sparkly things, you’ve probably spotted this Kat Von D Everlasting Glimmer Veil at Sephora or on the internet. There are 9 colors to choose from, as well as limited release hues (the color featured in this review is Shockful). 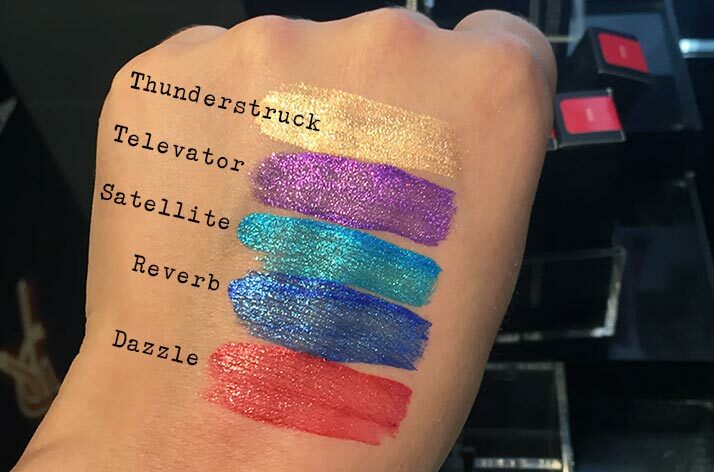 If you’re interested in the limited edition colors, grab them as soon as they hit Sephora – a shade called Super Sonic launched early October and sold out within 48 hours. This Kat Von D Glimmer Veil is a whisper-thin lip stain embedded with fine sparkles – not a lip stick or a lip gloss. This product dries very quickly, and unlike what I thought, you can’t easily mix them with another product to get a more subtle look. 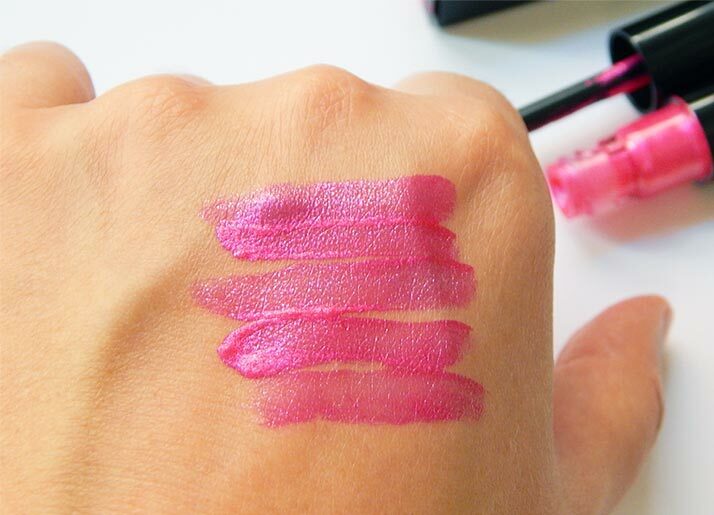 It’s all or nothing with these bold lip stains, so be ready to stand out in a crowd. 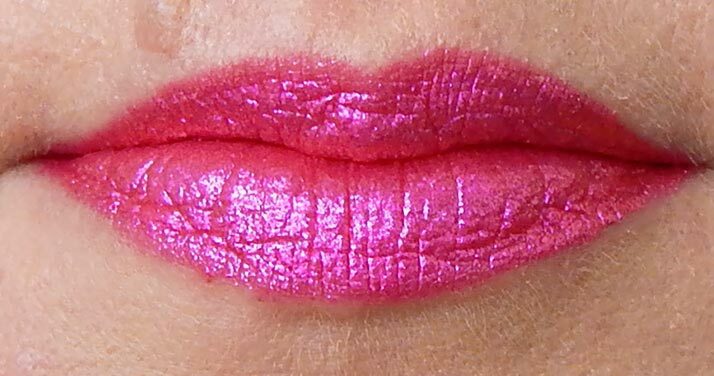 Since I love sparkly pink but mostly wear au natural make-up, my plan was to tone down this Kat Von D product by mixing it with a neutral lip gloss. However, that wasn’t successful – I quickly discovered that this Kat Von D Glimmer is water-based and doesn’t mix well with oil. While the stain part of the product certainly lasts 24 hours, the glitter part is very finicky. If you wear this product by itself, the glitter isn’t everlasting. DISCLAIMER: This product was purchased by the blogger. Neetzy.com received NO compensation from Kat Von D Beauty for this review. This review does not represent medical or professional advice, it is an opinion only. Photographs may not depict the exact color of the product. This product sells for $22 USD or $30 CAD at Sephora. This product is also available in the following colors: Thunderstruck (Gold), Rocker (Orange/Red), Dazzle (Red), Razzle (Pinkish Purple), Televator (Grape), Reverb (Deep Blue), Satellite (Cobalt Blue), and Wizard (Black). Here are a few of my tips for using this lip stain. Be sure your lips are dry and free of oily lip products (however, Kat Von D suggests you can apply this over other lip products). 1) Apply to dry, bare lips. 2) Take your time applying this product as the pigmentation lasts for over 24 hours. 3) Apply a thin layer to dry lips and allow the glimmer to dry for about 10 seconds. 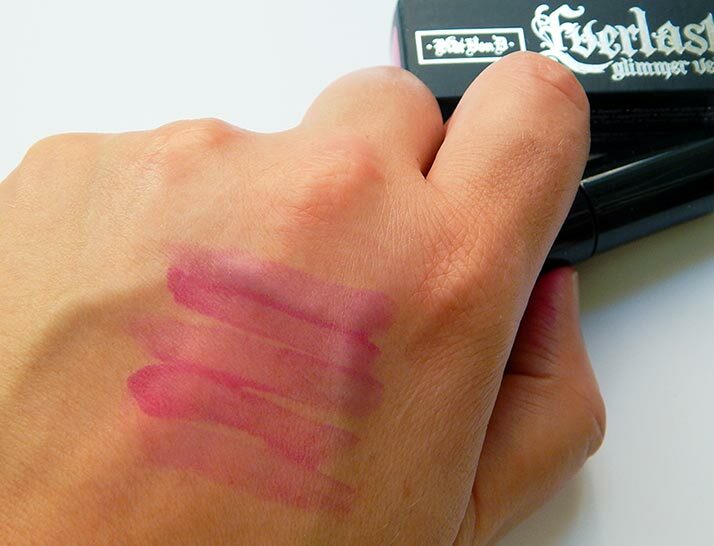 4) Avoid rubbing your lips together to distribute the product (this will just clump the product). 5) For an opaque look, apply a second layer and allow to dry. 6) To keep this product in place, avoid drinking or eating, or wetting lips. 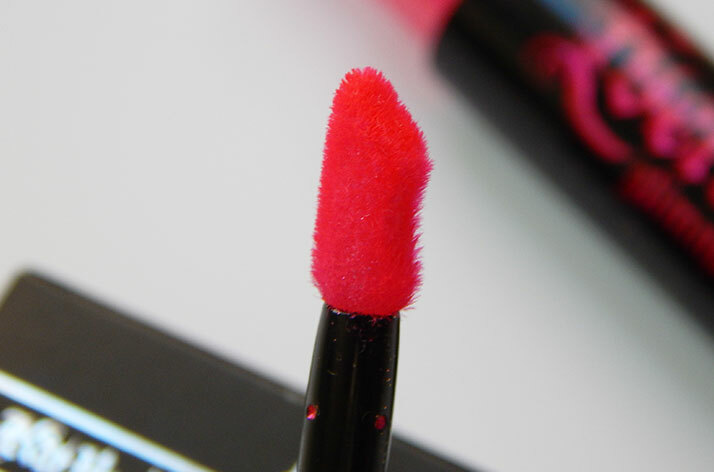 7) After several uses, wash the applicator brush in hot, soapy water for smooth application. 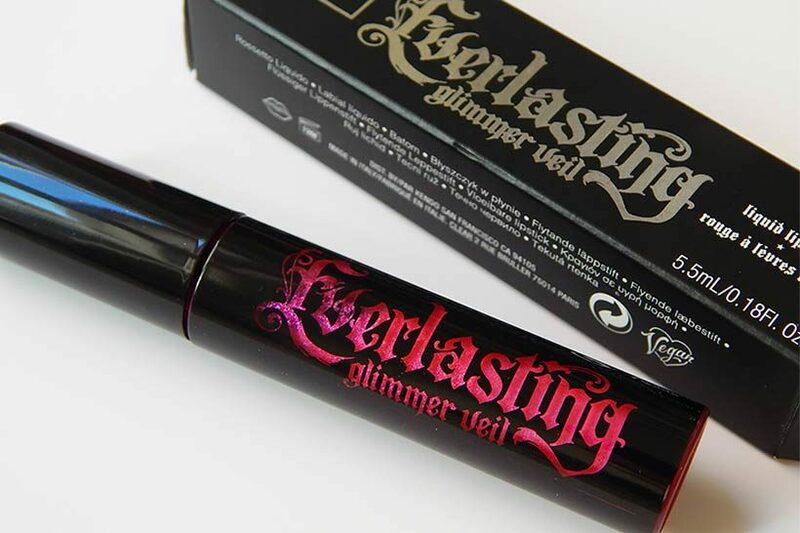 This Kat Von D Everlasting Glimmer Veil is ultra fine and of high quality. Keep in mind that it’s called a “veil” – basically, it’s a sheer covering (though two layers of this product gives a very opaque finish). I really didn’t appreciate how light this product was until I wore it several times. It is utterly weightless, even when wearing two layers. I assumed this product would work like a lip gloss when I first starting experimenting with it, but it is indeed a matte product that creates thin coating of glitter mixed with a flat color stain. Also, these Everlasting Glimmer Veils are water-based, so they don’t like coming in contact with water or oil. So be prepared to reapply the product after drinking a few sips of coffee or water. Even licking my lips made the glitter gum up and come off. The stain, however, remains in place for a good 24 hours. Lip stains are too dry for my liking (though this one didn’t make my lips too parched), and this Kat Von D Everlasting Glimmer Veil is too bold for my everyday make-up look. I’d perhaps wear this to a holiday party, but I will admit I didn’t leave the house wearing this on my lips. My boyfriend commented that is was a bit clown-like. Insert laughter here. However, this product made me happy every time I put it on – it’s a very cheerful, vibrant pop of happiness, but not very practical for me. 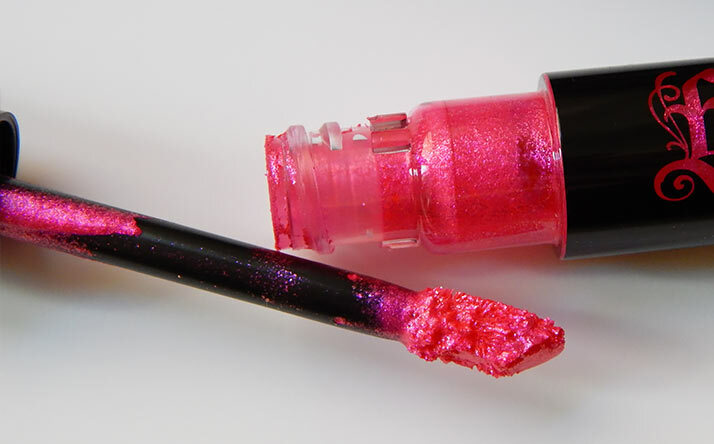 Unfortunately, to keep this product on your lips, you need to avoid any sort of beverage – even one sip of water causes the glitter to congeal and look bad. The glitter is not everlasting, though the stain remains in place for at least 24 hours. I purchased this Kat Von D Everlasting Glimmer Veil at Sephora in Canada for $30 CAD. This product is also available at Sephora in the US for $22 USD. You can also buy these Kat Von D Glimmer Veils at the Kat Von D website. Neetzy.com is NOT an affiliate of Kat Von D Beauty or Sephora stores. Aqua/Water/Eau, Aluminum Calcium Silicate, Propanedol, Acrylates/Ethylhexyl, Acrylate Copolymer, Ammonium Acrylates, VP/Eicosene Copolymer, Sorbitan Sterate, Acacia Sengal Gum, Silca, Potassium Cetyl Phosphate, Demethicone Peg-7 Phosphate, Polyglycel-4 Isosterate, Phenoxyethanol, Alcohol Denat., Hydroxyethylcellulose, Hydrogenated Starch Hydrolsate, Disodium Deceth-6 Sulfosuccinate, Laureth-30, Laureth-21, Tin Oxide, Sodium Hydroxide, Ethylhexyl Glycerin, Sodium Dehydroacetate, Trisodium Ethylenediamine Disuccinate, Sodium Phosphate, Disodium, Polysorbate 20, Titanium Dioxide (Cl 77891), Red 28 Lake (Cl 45410). IF YOU LIKED THIS REVIEW, PLEASE SHARE OR LEAVE A COMMENT BELOW. WOULD YOU WEAR THIS PRODUCT, OR IS IT TOO BOLD FOR YOUR EVERYDAY LOOK? I appreciate this review. I think I’ll stay away from this product.